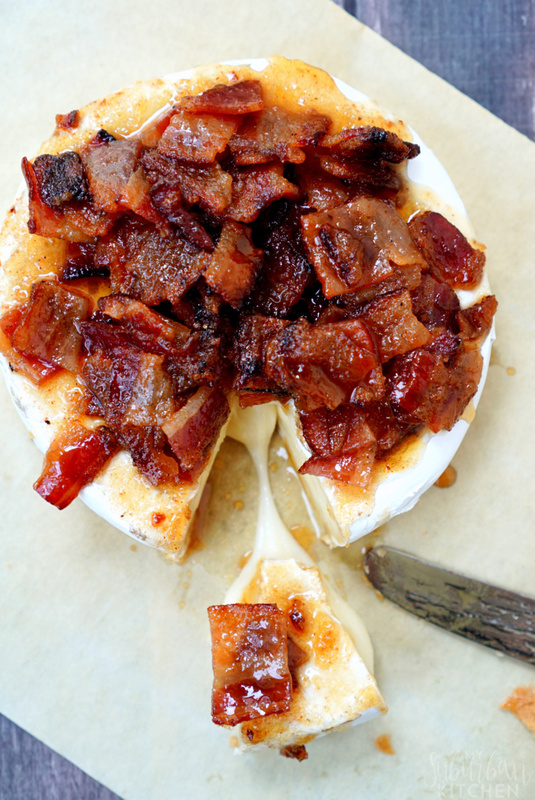 Your next party will be one to remember when you serve this Cayenne Candied Bacon Brie recipe. Everyone will want a taste of this sweet and spicy brie appetizer! I don’t have a single friend who doesn’t love bacon. And you guys all know I have a total love affair with bacon. So, any party we have will involve bacon and, right now, that means Cayenne Candied Bacon Brie will be on the table. It is the party appetizer that no one can resist! This recipe is the perfect combination of sweet, spicy and creamy brie. Be sure to buy a large wheel of brie though because you are going to want plenty to share with friends and family. I definitely recommend going with a milder brie for this recipe. 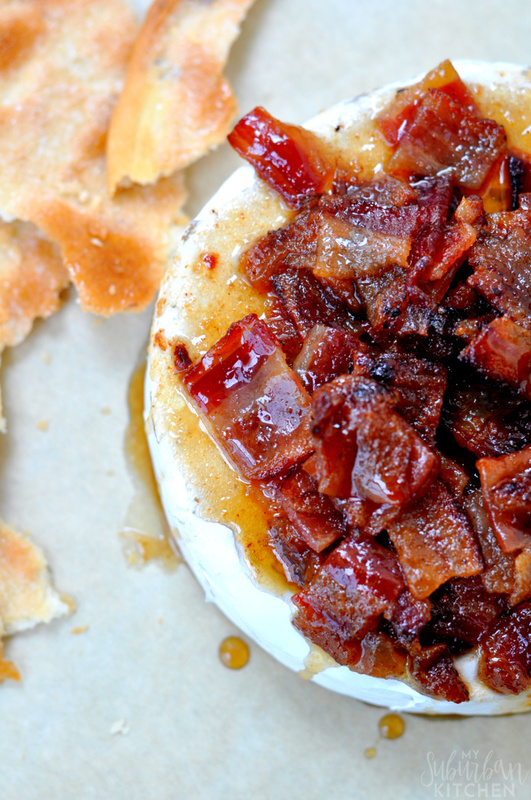 The creamy brie makes the perfect complement to the sweet and spicy bacon. I love the crunch the brown sugar bacon provides too. If you aren’t sure how to make candied bacon it’s actually quite simple. All you need is three ingredients, brown sugar, cayenne pepper, and bacon of course. Lay your bacon out on a tray like you normally would and spoon on a mixture of brown sugar and cayenne pepper onto each one. Then just bake your bacon for 25 minutes with one flip in the middle, until it’s nice and crispy. All you have left to do is cut it into small pieces and then it’s ready to go for whatever you have planned. That’s the only candied bacon recipe you’ll ever need! This is a great dish for parties because you can make the candied bacon portion ahead of time and then finish it the day of your event. We serve this with crackers, soft bread and even a few vegetables on the side for those who may want a little healthier dipping option. If you aren’t a fan of a little bit of spice, you can easily leave the cayenne pepper out of the recipe. The candied bacon and brie will still go together so well. Be sure you get a pure maple syrup that is a high grade too. It will make all the difference in the flavor of your Cayenne Candied Bacon Brie! 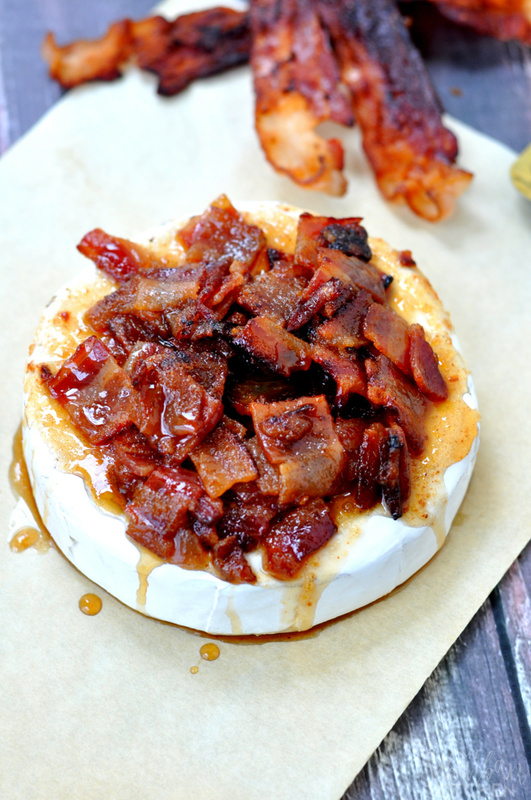 If you make cayenne candied bacon brie or any other recipe from the blog, I’d love to hear about your experience. Let me know if the comments or snap a photo and tag it #MySuburbanKitchen on Instagram or Twitter. 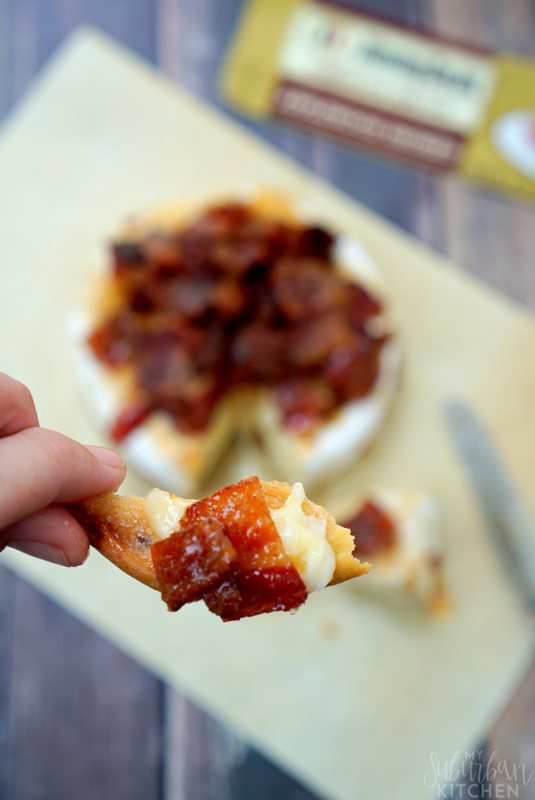 Your next party will be one to remember when you serve this Cayenne Candied Bacon Brie. Everyone will want a taste of this sweet and spicy brie appetizer! 1. Preheat oven to 400 degrees. Line a rimmed baking sheet with nonstick aluminum foil. Place a spray a metal cooling rack with nonstick cooking spray and place it on top of the aluminum foil. Lay bacon in a single layer on top of cooling rack. 2. In a small bowl, combine 1 cup brown sugar and cayenne pepper. Stir to combine. Spoon on top of bacon. Bake in oven for 15 minutes. Turn pan and bake for an additional 10 minutes. Remove from oven and reduce oven temperature to 350 degrees. 3. Let bacon cool slightly and chop into small pieces. In a medium skillet over medium heat, combine bacon pieces, 1/4 cup brown sugar, vinegar and maple syrup. Bring to a boil and then simmer for 2-3 minutes until bubbly. 4. On a rimmed baking sheet sprayed with nonstick cooking spray, place brie wheel. Top with bacon mixture. Bake in oven for 10 minutes. Let sit for 5 minutes before serving. The cayenne candied bacon can be made up 2 days in advance.